← Solargate: How much longer will Solyndra (and others) be around? UPDATE: Just heard on the radio that Solyndra is filing for Chapter 11 bankruptcy and will lay off 1,100 employees, essentially their entire workforce. Yesterday I questioned what’s going on in the solar industry and picked Solyndra as a potential candidate to close its doors since it’s losing titanic amounts of money. I wasn’t off the mark at all. 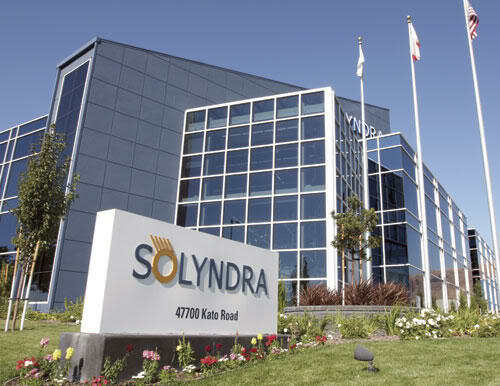 This morning, it sounds that Solyndra may announce it’s closing its doors. According to KTVU Channel 2 News in Oakland, California this morning, employees are being laid off and given unemployment packets. Today, I again wonder if they’ll now file bankruptcy and take their manufacturing to China like Evergreen Solar of Massachusetts? U.S. solar company Solyndra, which once had dreams of a big IPO, is headed into bankruptcy. A analyst in the solar market said an announcement from the embattled U.S. solar company was imminent, expected at noon on Wednesday, after speaking with an employee of the firm in Europe, where all employees were told on Wednesday that they were being let go. A local Bay Area NBC affiliate also posted a report saying doors of a Solyndra California location had been shuttered and quoted employees as saying the company was finished. KRON TV in San Francisco, California, is also now reporting live that workers are getting pink slips and are getting ready to attend a meeting inside Solyndra HQ to hear about what is happening. No wonder the CEO resigned and appears to be hiding out. Now I wonder how much of that loan money and VC money he has stuffed in his bank accounts and what will happen to it? After visiting this plant and touting green jobs I wonder what President Obama will have to say about this? He’ll probably remain silent and play golf or go on another vacation. That’s $535 million of your tax dollars thrown out the window by President Obama. That’s what the federal loan guarantee was and no doubt Solyndra won’t be able to make good on it. With things like this it’s no wonder we need to increase the federal debt limit. As for Jerry Brown and Arnold Schwarzenegger, who have been touting all these wonderful green jobs in California, here’s another massive green jobs fail for you. Now California will again get to blow more money on unemployment checks instead of raking in tax dollars. Their sub-contractors will no doubt be laying off their people next and the city of Fremont, California, will not be getting any revenue from this bad deal either. There will now be two Solyndra building that will be empty or almost empty sitting beside Highway 880 in Fremont. Want to bet no one goes to jail over this? I hope Congress takes a hard look at this. Yet more CO2 Insanity of the expensive kind.